Natasha Irons is restless, she has spent a lot of time preparing for the JLU, developing a super-mech suit that can grow to enormous size. Her problem is John Henry Irons won't let her be a Leaguer until she's slowed down a little and gone through a 'rites of passage'. Natasha argues that Flash was barely older than her when he helped found the League but Steel isn't listening - monitor duty beckons. Natasha is moping around when the JLU is called away to deal with disasters around the world. Disasters called - The Millennium Giants. 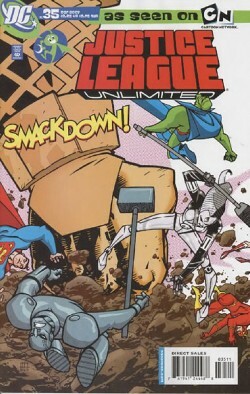 The full force of the JLU is nothing compared to the Giants, England and Egypt are being decimated by the giants. Wonder Woman exclaims their powers are like the force of the entire planet. Natasha hears this as she watches from the vidscreens and sees that another disaster is erupting in Mexico. Hotheadedly she races into battle alone. Superman orders Flash to help her and he arrives just in time to save her from a foolhardy battle. However the scarlet speedster isn't quick enough to intercept the Giants gaze right into the core of Natasha's very being. The JLU regroup on the Watchtower and Dr. Fate fills them into the Millennium Giants' life purpose, to cleanse the Earth for the next life cycle to begin. There is no way to stop them, they'll plow through until their mission is complete, to recharge the ley lines of Earth. That key word 'plow' unlocks something in Natasha's mind and her high intellect plans a counter balance. With the uneasy help of Steel, Natasha rebuilds and adapts her armour to face all the Giants. The JLU including Steel had assumed Natasha was prepared for battle but 'Steel Jr.' proves she's more than muscle, she's a highly intelligent woman. Smashing her hammer at a specific point in the Giants' path, and channelling her armour's power through it, the planet's ley lines are cleansed without the planet having to be cleansed of life and the Giants vanish back into the Earth. Natasha knows she'll carry the memory of the Millennium Giants gaze with her forever, it was her defining moment - when she proved she was more than a kid, more than a woman, but a hero like the members of the JLU. Story - 5: What's going on? This is great! First Guy Gardner becomes a New God Lantern, now Natasha is a new Leaguer. I am loving the fact this title is now going in a direction. I am hoping you guys do too. It's nice to see stories that have some impact going somewhere. Also the blandly poor DCU Millennium Giants storyline was expertly turned into a done-in-one issue, kudos for that! Surprised that the whole Electric Superman and Superman Red/Blue thing wasn't utilised to make it a story of more impact, however the fact it introduces a new JLU member makes up for that. Natasha Irons armour is based heavily on her DCU designs which are ugly - now her animated counterpart looks unbelievably ugly too! Perhaps it was the heavy inking or her bland coloring, but Miss Irons didn't look as awesome as she could have. The Leaguers did have their cool moments and the Giants were cool but again not up to usual standards. Cover Art - 3: The cover does nothing to help the issue which is a shame as it was a really good story. It could have been so much more but ended up screaming 'kidfest' which is a total shame. A while ago Millennium Giants was a big DCU event, even making it the 'curse' and 'cure' of Electric Superman and of course Superman Red/Blue. Funny how the cover seems to belittle it somehow.